Perusing through women's interest magazines from the 1950s-1970s, you will often find advertisements for women to put weight on. Being called “plump as a partridge” used to be a complement for women; whereas, it might get you a slap in the face today. It was flattering because a little “plumpness” meant health and vitality. 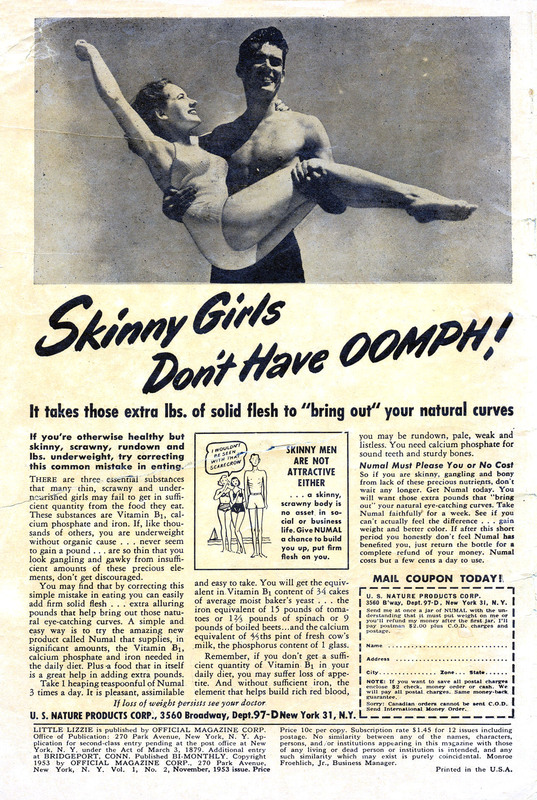 However, this began to change with the Industrial Revolution, with a trend toward “skinny” ever since. Granted, it has not been a steady even path toward skeletal figures – there have been ups and downs over the decades. The ideal figure in the 1920s was quite thin, epitomized by the Flapper. 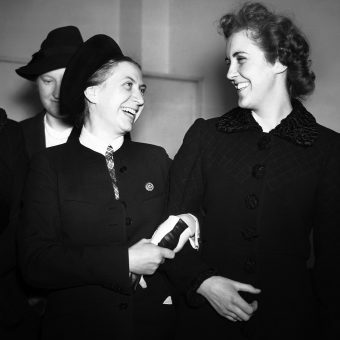 Indeed: “The highest reported prevalence of disordered eating occurred during the 1920s and 1980s, the two periods during which the ‘ideal woman’ was thinnest in US history” –Journal of Communication (1997). Mid-century, the Marilyn Monroe, curvaceous figure was in, but the emaciated Twiggy look gained popularity in the sixties. The incidence of severe anorexia nervosa requiring hospital admission rose significant during the 1960s according to journal Current Psychiatry Reports in 2012. 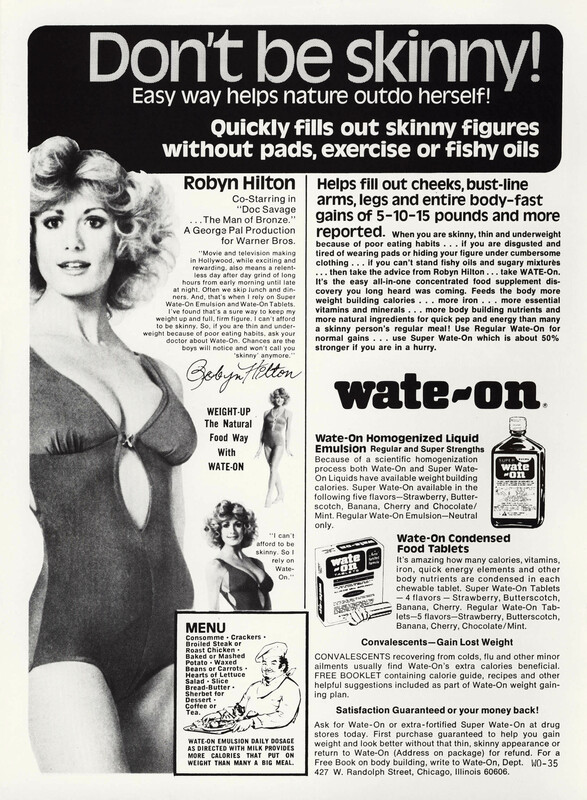 Things plateaued in the seventies, then trended toward ultra-skinny in the eighties and nineties. Suffice it to say, the idealized female body type changes year to year – with the population desperately trying to keep up with the images presented in mass media. 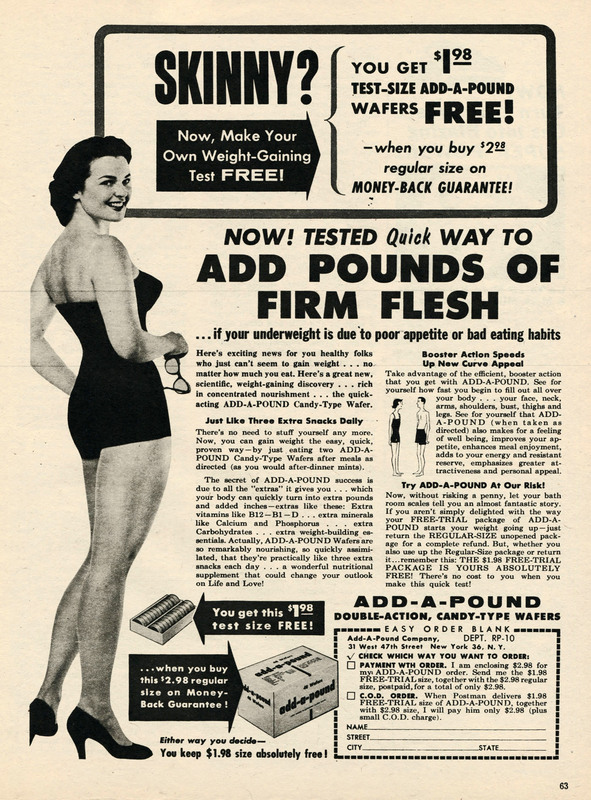 Perusing through women’s interest magazines from the 1950s-1970s, you will often find advertisements for women to put weight on. 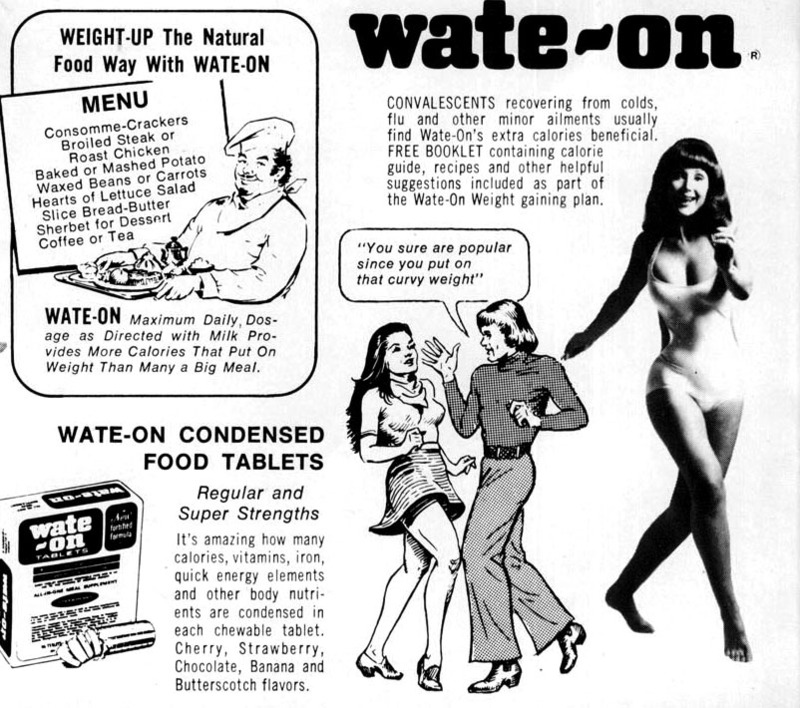 Yes, these are products designed to help women gain weight. 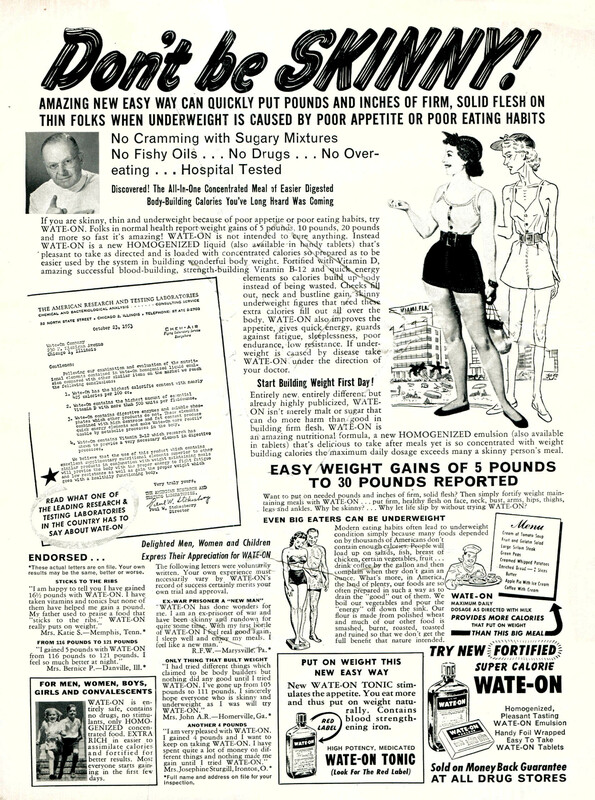 This seems almost incomprehensible today; however, when portion sizes were smaller and fast-food wasn’t around every corner, it wasn’t unusual for a woman to actually fall below the ideal body weight – especially in the curvaceous 1950s. 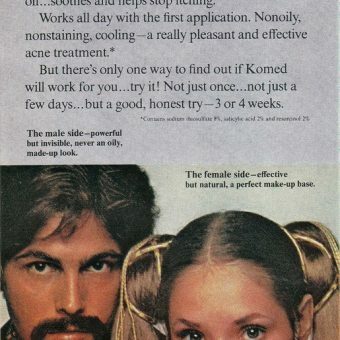 Of course, we’re not going to pretend products for women (and men) to gain weight aren’t still around. A quick Google search reveals an endless supply of products to help you put the pounds on. There’s even a popular “booty boosting balm” called “Get Thick”. 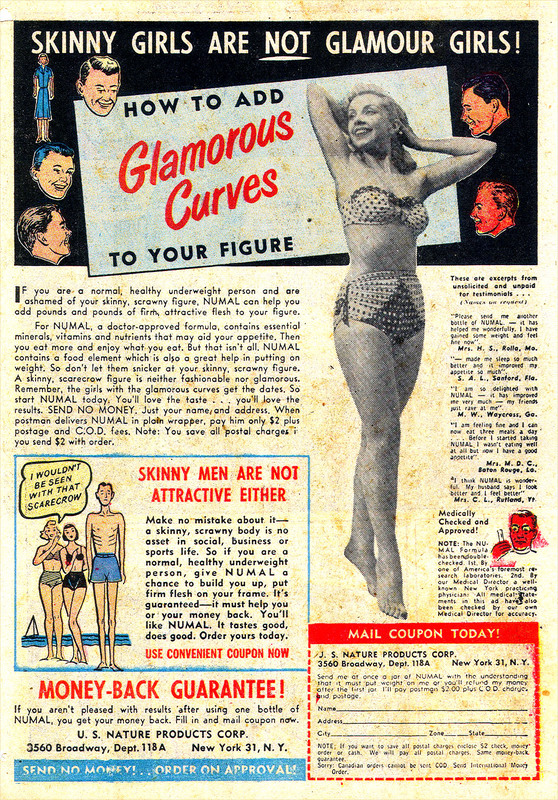 So, the point isn’t to show illustrate how a fuller figure used to be more accepted; rather, that attainment for that “perfect body type” has been an ongoing, ever-changing battle, with a seemingly infinite array of products promising to get you there. If you’re “underweight” it’s due to “poor appetite or bad eating habits” – not a chance at all it’s due your genetics. Look at those eyelashes! 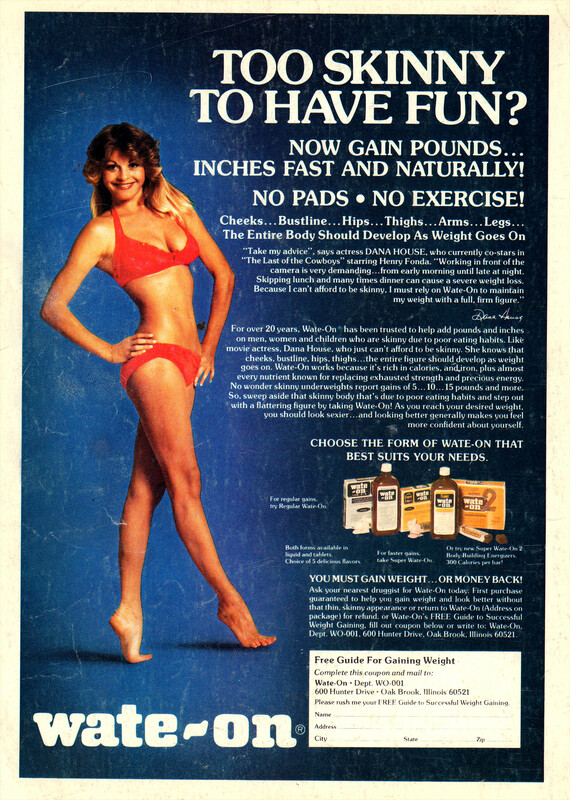 This ad is from 1977 and they’re still referring to underweight figures as “scrawny”.